The program was created by Sherry Lebed Davis, a professional dancer, along with her two surgeon brothers, with input from physical therapists. It was used for 8 years as part of the breast cancer follow-up program at Albert Einstein Medical Center in Philadelphia where its success was researched and documented in the "American Physical Therapy Association Journal". The video shows 5 women (see below description) following the direction of Sherry, the narrator, through a series of gentle stretches and dance exercises with alternating slow and faster sections. The movements have been designed specifically to focus on regaining and maintaining flexibility in the shoulder joints, and are repeated an average of 3 times per movement, per side. (It is important to balance the body by doing both sides, not just the affected side.) The exercises are fun, unintimidating, and provide a wonderful way to exercise at home and help improve the quality of life for breast cancer survivors. 49 minutes long, about 42 minutes of exercises and the rest narrated information. There are 5 women shown on the video, all of whom are breast cancer survivors. They range in age from 35 to 72, and are survivors from 6 months to over 20 years. They are "typical" women of various sizes, shapes and abilities, shown wearing basic, comfortable clothing. "Focus on Healing through Movement & Dance "The Lebed Method" (FOH) reserves all rights and restrictions for use of this video. This video is for personal home use only. It is not to be used in facilities for group instructional programs. Focus on Healing, Inc. provides specific, in-depth Teacher Certification Programs to train people to lead such group classes. For further information about this Certification, please visit FOH, Inc. at www.focusonhealing.net. Reproduction, modification or distribution of this video without the express written consent of FOH is prohibited. FOH is not liable for any injury, illness or damage, resulting from the active or passively negligent use of the video, or resulting from the instruction of individuals not trained, certified and licensed as instructors, in good standing by FOH. If you are interested in information about the Teacher Certification Training Program for FOH, please contact Sherry Lebed Davis at 1-877-365-6014 or go to her website: www.focusonhealing.net. "It is critical for women to start moving right away after treatment and that they continue moving if they are to maintain their mobility. Sherry Davis's approach will make a big difference in the quality of life of women after breast cancer." "I have not seen another program so well-suited to breast cancer survivors. It is unique." 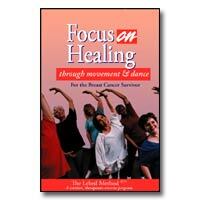 "Focus on Healing can greatly benefit women who have undergone surgery for breast cancer." "Focus on Healing is a creative therapeutic exercise program that helps reduce the common side effects of treatment and surgery of breast cancer patients. (It addresses) the two complications most often experienced by breast cancer patients: frozen shoulder, which is a surgical complication and lymphedema."